The company’s retreat capped several days of intense behind-the-scenes maneuvering between government officials and Amazon executives. Insiders say the company thought it could get the controversial package of incentives and benefits approved, but feared it would face a charged climate of heightened scrutiny for years to come. 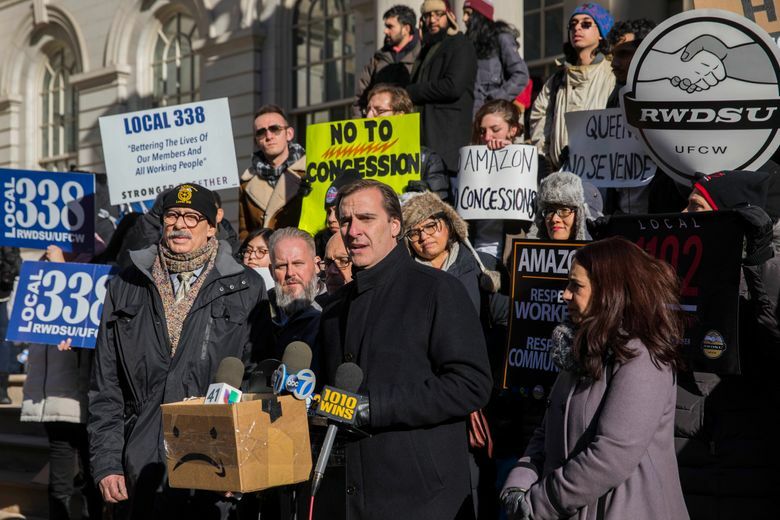 NEW YORK — A senior executive from Amazon, one of the world’s biggest companies, led by the world’s richest person, found himself last weekend in a showdown with a suburban state senator. The executive, Brian Huseman, who is based in Washington, D.C., was trying to find out whether the New York state senator, Andrea Stewart-Cousins, would exert more control over an obscure state board that had the authority to block Amazon’s ambitious plans to expand in New York City. It was the second phone call in two days between Huseman and Stewart-Cousins, who had just risen to power as Democratic majority leader. And once again, Stewart-Cousins told Huseman that state lawmakers would use their power to assess the deal. “We just need to move on,” Stewart-Cousins said, she recalled in an interview. The company’s retreat capped several days of intense behind-the-scenes maneuvering between government officials and Amazon executives, including efforts by Gov. Andrew Cuomo to woo unions and Mayor Bill de Blasio to try to reach Jeff Bezos, the company’s chief executive. On Monday, Cuomo and de Blasio, bitter rivals who had put aside their differences to mount a bid for an Amazon site, met in Albany to discuss how to pacify unions that had voiced strong objections to the company. De Blasio then called a top executive in the company, seeking assurances that the deal was still on. The executive did not indicate that it was in trouble. Public-housing residents rallied Monday, when a second poll came out showing broad support around the state for the deal. “We’re working to make sure that folks from our neighborhood could benefit from those jobs; there’s going to be a lot of jobs,” Bishop Mitchell G. Taylor, a community leader, said Monday. Taylor grew up in the Queensbridge Houses, the large public-housing development in Long Island City. On Tuesday morning, senior aides to the governor and mayor talked by phone with Huseman about next steps, including how to promote the jobs that the company was planning for New York. By Wednesday, a senior Amazon executive in charge of real estate, John Schoettler, arrived from Seattle for a meeting convened by Cuomo in his Manhattan offices between Amazon and unions. By the end, the unions and the executives seemed to be making progress toward a resolution. The choice blindsided Cuomo and de Blasio. “Out of nowhere, they took their ball and went home,” de Blasio said Thursday night. He learned of the decision in a phone call from Jay Carney, an Amazon vice president and a former spokesman for President Barack Obama, according to a person briefed on the call. “Amazon underestimated the power of a vocal minority and miscalculated how much it needed to engage with those audiences to make HQ2 a success,” Joseph Parilla, a fellow at the Brookings Institution, said, referring to the second-headquarters search. The company, in particular, failed to develop a robust strategy to address the growing influence of the progressive left in New York, led by Rep. Alexandria Ocasio-Cortez, of Queens, who was elected in November and was a fervent skeptic of the deal. A spokeswoman for Amazon declined to comment for this article. But two people involved in internal discussions at Amazon said the company’s concerns were not primarily that the deal would fail to receive government approval. Executives were confident it would cross the finish line. Amazon executives involved in the negotiations said they were frustrated that the economic benefits of the project — a winning argument with many business leaders and some community members, including public-housing residents — failed to sway some officials. “What we were hearing from people — small-business owners, educators, community leaders — was completely different than what we were getting from the local elected officials,” said one of the people involved with the Amazon side. A turning point came on Feb. 4, when Stewart-Cousins, the new Democratic leader in the state Senate, selected Gianaris, the state senator and one of Amazon’s most vocal opponents, to the board with the power to block the deal. It was clear the opposition would not go away soon. Cuomo could refuse to appoint Gianaris, of Queens. But the company wanted to know: What would happen then? So on Feb. 8 and then again on Feb. 9, Amazon’s representatives spoke on the phone with Stewart-Cousins. She told the company’s representatives that Cuomo was planning to reject Gianaris. But she could not say precisely what would happen next, the people said. Who would be named in his place? But she did not offer any guarantees. Less than a week later, the deal was dead.